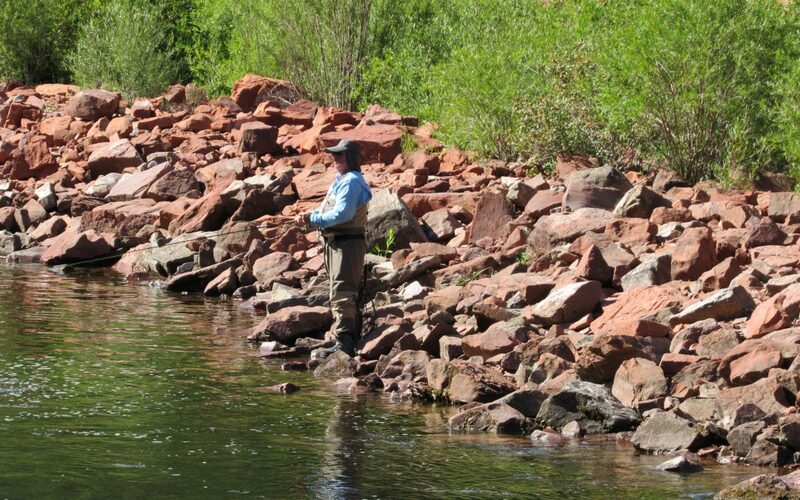 Colorado lawmakers have given preliminary approval to a bill expanding a program designed to keep water in streams for the benefit of fish and the aquatic environment. The Colorado House of Representatives approved House Bill 19-1218 on April 1. The measure, if it becomes law, amends the state’s instream flow program to give it more flexibility to work with farmers and others who are interested in loaning water to streams. Representative Dylan Roberts (D-Eagle), the bill’s sponsor, said that he proposed the modest expansion of the program to provide more flexibility to help reduce stress on streams caused by climate change and recent drought. Colorado, in 1973, was one of the first states in the country to adopt an instream flow program. Back then, under Western water law, water rights applied only to strictly defined “beneficial uses,” which involved removing water from streams to serve primarily municipal, industrial and agricultural users. The 1973 law changed that, adding environmental protection to the list of beneficial uses and giving the Colorado Water Conservation Board (CWCB) the right to claim water rights for the benefit of streams themselves. Those instream flow rights are typically much younger, or junior, to many of the historic water rights that were claimed more than a century ago. As a result, during times of drought or heavy use, those junior water rights aren’t entitled to any wet water, leaving streams with an inadequate supply. To address that problem, under the existing law, more senior water right holders can loan water to the CWCB to boost instream flows during dry periods. The bill as originally drafted would have allowed the instream flow program to accept larger loans of water for the stream, when it was available, to improve the environment, beyond the minimum legally allowed under the existing law. In addition, it would have allowed loans to streams in which the CWCB does not have an instream flow water right. Another provision in the bill would have expanded the exercise of the loan to any five years, up from three, within a 10-year period, and allowed a loan to be renewed for two additional 10-year periods. Bill supporters included conservation groups such as Trout Unlimited, Conservation Colorado and The Nature Conservancy, along with Northern Water and CWCB. Among the changes to the original bill is a component designed to limit any potential harm if irrigated land is taken out of production to provide water for the loans. The bill was also amended to remove the provision which allowed loans in streams where the CWCB does not hold an instream flow water right. “We’ve worked with a variety of stakeholders to ease their concerns,” said Josh Kuhn, a water advocate with Conservation Colorado. Still, agricultural groups, such as the Colorado Farm Bureau, aren’t ready to sign off on it yet. The bill is scheduled to be heard in the Senate Agriculture committee April 17. Fresh Water News Editor Jerd Smith contributed to this report. Larry Morandi was formerly director of State Policy Research with the National Conference of State Legislatures in Denver, and is a frequent contributor to Fresh Water News. He can be reached at larrymorandi@comcast.net. Fresh Water News is an independent, non-partisan news initiative of Water Education Colorado. WEco is funded by multiple donors. Our editorial policy and donor list can be viewed at www.wateredco.org.